In recent years, policymakers and labor advocates have proposed raising the minimum wage at federal, state, and local levels. On the local level, these efforts have been somewhat successful as a number of major cities have enacted minimum wage increases over the last few years. These cities include San Francisco and Seattle, which both enacted laws to implement a “living wage” of $15 per hour. 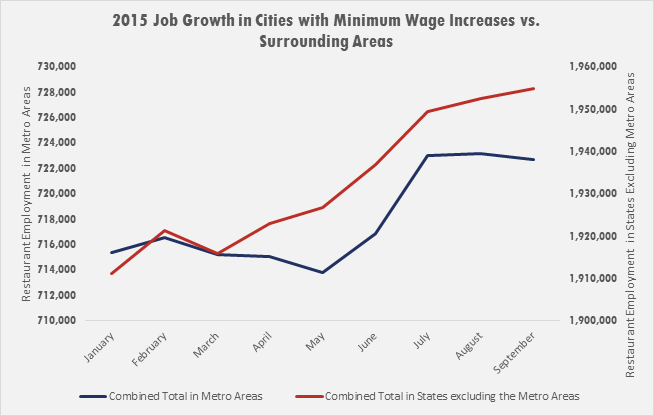 Beginning this year, several major cities took steps to phase in these large minimum wage increases. Now that we are almost to the end of 2015, these cities provide a new source of evidence to evaluate the labor market implications of raising the minimum wage. American Enterprise Institute’s Mark J. Perry has been tracking employment patterns both in Seattle and in the rest of the state of Washington, finding that restaurant employment in the city has been falling since the beginning of the year while it has been rising in the rest of the state. But, how have the rest of the major metropolitan areas fared? The facts show that this year restaurant employment in the major metropolitan areas with minimum wage increases has consistently experienced slower growth than restaurant employment in the rest of their states. This year, the seven major U.S. cities that implemented minimum wage increases are Chicago, Louisville, Seattle, Washington, Oakland, San Francisco, and San Jose. These minimum wage increases are detailed in Table 1. Most of these minimum wage increases are the beginning of much larger minimum wage hikes. For instance, San Francisco’s and Seattle’s minimum wage increases were the first steps to increasing the cities’ minimum wages to $15. In other cities, the minimum wage implementation is much further along. San Jose raised its minimum wage from $8 to $10 in 2013. Since then, the minimum wage in San Jose continues to rise with inflation. This year it increased by only 15 cents from $10.15 to $10.30. Overall, the San Francisco Bay Area has been full of cities implementing substantial minimum wage increases. Besides San Francisco and San Jose, the cities in the Bay Area that are phasing in minimum wage hikes are Berkeley, Emeryville, Mountain View, Oakland, Sunnyvale, and Richmond. As noted in a previous American Action Forum (AAF) paper, when evaluating the impact of the minimum wage it is necessary to ask the right question. For instance, evaluating the effect of the minimum wage on total employment trends would generally yield irrelevant results because only about 2 percent of all wage and salary workers earn at or below the federal minimum wage. It is very unlikely that a minimum wage increase would affect the majority of workers who earn significantly above the minimum wage. As a result, any analysis that examines the entire workforce is likely to understate the labor market consequences of raising the minimum wage because the vast majority of workers do not earn low wages. Thus, in order to fairly examine the labor market consequences of increasing the minimum wage, it is essential to examine low-wage workers who actually earn at or slightly above the current minimum wage. This includes young, low-skilled workers, the exact population policymakers are trying to help by increasing the minimum wage. One way to zero in on the low-wage population is to examine recent job growth trends in an industry that actually employs low-wage workers. This paper examines 2015 job growth in restaurants, specifically food services and drinking places, which in 2013 employed 48.78 percent of all workers who earned at or below the federal minimum wage. Food services and drinking places continue to employ low-wage workers today, as the average hourly pay rate of production and nonsupervisory workers in that industry was only $11.51 in September 2015. Evaluating job growth in food services and drinking places provides a valid idea of how recent minimum wage hikes are impacting job creation for low-wage workers. To analyze trends in city restaurant employment relative to the rest of the state, we use the most localized data for each metropolitan area available in the Federal Reserve Bank of St. Louis’s Federal Reserve Economic Data (FRED). For each city, we use seasonally adjusted food services and drinking places employment data in the metropolitan statistical area (MSA) or metropolitan divisions (MD), illustrated below. Although we do not directly analyze the cities that raised the minimum wages (except in the case of Washington, DC), analyzing employment trends in the entire metropolitan areas may still provide useful information on the impact of the minimum wage on low-wage employment. In addition, by evaluating the metropolitan areas, we are also able to take into account trends in smaller localities that are following in the footsteps of the major cities by raising their own minimum wages. This is particularly true in the San Francisco Bay Area where a large number of smaller towns surrounding the major cities have enacted their own minimum wage increases. For instance, the Oakland-Hayward-Berkley MD includes Oakland and Berkeley, both of which began phasing in minimum wage increases. In addition, the San Jose-Sunnyvale-Santa Clara MSA includes San Jose, Sunnyvale, and Mountain View, which all increased their minimum wages to $10.30 this year. For each metropolitan area, we measure the growth in food services and drinking places employment in 2015. Consequently, we measure the percent change in food services and drinking places employment from December 2014 to September 2015, the most recent month with available data. We do the same for the state that the metropolitan area is located in and exclude the metropolitan area itself. Since Washington, DC is not located in a state, we compare restaurant employment growth the District to the growth in Virginia and Maryland combined. We then combine food services and drinking places employment in all of the metropolitan areas and combine employment in all of the metropolitan areas’ surrounding states. This allows us to compare restaurant employment growth in all the metropolitan areas that raised the minimum wage together to restaurant employment growth in all of the rest of the states together. The chart below shows that restaurant employment in metropolitan areas with cities that raised the minimum wage in 2015 has lagged behind employment in the rest of the states. Clearly, restaurant employment has grown far slower this year in cities that raised the minimum wage than in the rest of the states in which those cities are located. This year restaurant employment in the metropolitan areas with major cities that raised the minimum wage only grew 1.1 percent through September. In the surrounding state areas, however, restaurant employment grew 2.8 percent. Table 3 shows the percent growth in restaurant employment in each metropolitan area and in the rest of the area’s state. Restaurant employment in the major cities that raised the minimum wage this year has consistently been slower than the rest of the states in which the cities are located. Restaurant employment in Louisville grew 2.6 percent, 1.1 percentage points lower than restaurant employment growth in the rest of Kentucky. In Seattle, where the minimum wage is increasing to $15 per hour, restaurant employment has only grown 0.6 percent this year while restaurant employment in the rest of the state of Washington grew 6 percent. In the other city that is phasing in a $15 minimum wage, San Francisco, restaurant employment only grew 1.4 percent and in the rest of California it grew 3.2 percent. There are also a few exceptions in the major cities we examine. In particular, restaurant employment in Chicago grew at about the same rate as in the rest of Illinois (0.5 percent versus 0.4 percent). Also, restaurant employment in Oakland grew faster than the rest of California (4.1 percent versus 3.2 percent). Despite the faster growth in Oakland, however, restaurant employment in the three major cities of the San Francisco Bay Area only grew 1.9 percent. That is 1.7 percentage points slower than the 3.6 percent growth in restaurant employment experienced in the rest of California. In Washington, DC, meanwhile, restaurant employment fell 0.6 percent. In Maryland and Virginia, it increased 0.9 percent. Interestingly, Washington, DC, is the only city that we are able to directly measure the change in restaurant employment in the District itself (rather than the metropolitan area) and it by far has the most negative employment trends. In all other cities we measure the change in restaurant employment in the metropolitan regions where these cities are located, which include towns that did not increase the minimum wage. As a result, it is possible that the employment trends in the smaller towns also included in metropolitan areas measured could be making the employment growth in the metropolitan regions more positive than what is actually being experienced in the cities that raised their minimum wage this year. While cities continue to phase in large minimum wage hikes, the verdict is still out on how these policies will impact local employment. The early data, however, do indicate a slowing of restaurant employment growth. As these steep minimum wage increases continue to be implemented, it is possible that these trends may become more worrisome over time. Our results for Seattle differ from AEI’s Mark J. Perry’s because he used Seattle MSA and we used Seattle MD.